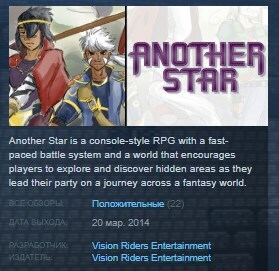 Another Star is a console-style RPG with a fast-paced battle system and a world that encourages players to explore and discover hidden areas as they lead their party on a journey across a fantasy world. While clearly influenced by the style and gameplay of the past, the game also implements innovations and ideas from the present. Secrets are hidden everywhere, and you never know what you might find on the next screen. Our story begins with Tachi, the prince of Clan Minas, eager to prove himself as a warrior. Under his father's orders, Tachi is sent on a mission to retrieve a fallen star in the hopes that it will bring power and glory to his clan. But before long, Tachi's quest spirals out of control with clans betraying each other in the hope of getting the star's power for themselves. Thus begins a chain of events that will set Tachi on a journey across the entire planet, eventually learning the true nature of the fallen star he had once hoped to harness. Approximately 20 hours of gameplay for the main storyline. Secret areas are hidden everywhere. Those who explore are sure to be well rewarded. Over a dozen dungeons to delve into and conquer, some hidden off the beaten path. Optional CRT filter, originally developed for console emulators, that can be enabled and disabled at any time. Over 30 original music tracks composed using actual samples from the Yamaha YM2413 FM chip. Five difficulty levels, giving each player a chance to beat the game on their own terms. Four levels of character growth speed, including an "Old School" setting for those who love to grind for EXP. Both the game difficulty and character growth can be customized at any time from the options menu.